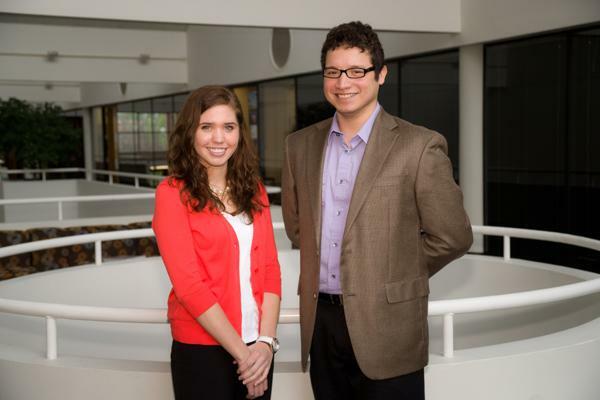 Two Truman students have been selected to receive the prestigious Barry M. Goldwater Scholarship for the 2012-2013 academic year. Lauren Choate and Miguel Fernandez Flores are among the 282 individuals chosen for the national competitive scholarship. Choate, a biology major from Farmington, and Fernandez, a physics and mathematics double major from Festus, are two of only six Missouri residents to receive the award this year. Lauren Choate will use her scholarship to continue her work in biology and Miguel Fernandez Flores for his in physics. Both students applied for the award through Truman’s Graduate Studies Office. Choate and Fernandez each have aspirations of attaining a Ph.D. and conducting research in their respective fields. Choate also credits her early experiences at Truman for helping her secure a Goldwater Scholarship. “Truman gave me the opportunity to get involved in undergraduate research as a freshman and through this I found an area of research that I truly enjoy,” she said. The Goldwater Scholars were selected on the basis of academic merit from a field of 1,123 mathematics, science and engineering students who were nominated by the faculties of colleges and universities nationwide. The one- and two-year scholarships, awarded annually to sophomores and juniors, cover the cost of tuition, fees, books and room and board up to a maximum of $7,500 per year. Fernandez plans to have the scholarship for one year, while Choate will have it for two. 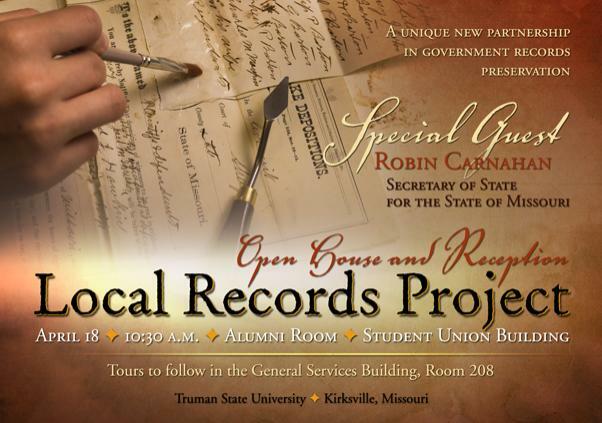 Truman will showcase the work of the Local Records Preservation Project at an open house with special guest Missouri Secretary of State Robin Carnahan at 10:30 a.m. April 18 in the Student Union Building Alumni Room, with tours to follow in the General Services Building Room 208. The Local Records Preservation Project is a unique partnership with the Missouri Secretary of State’s Office to provide workspace for an area archivist to process pre-1900s court documents and prepare them for duplication and storage via microfilm. The project has been running at Truman since September 2011. This preservation project serves as a special opportunity for Truman students to get involved. An internship program is available each semester, including the summer term, where students receive training in archival work, hear lectures by state archivists and have opportunities to tour state facilities in Jefferson City. In their archival work, participants will do hands-on work cleaning, preparing, processing and indexing court records. Students can receive academic credit for their participation. Mary McIntosh, the local archivist in charge, will be working with Truman students while Jeff Gall, professor of history and social science education, will be their advisor. “This is an extraordinary opportunity for our students to work closely with a state archivist and explore careers available in the fields of archives and historic document preservation,” Gall said. Currently, four students are helping in the preservation project, but that number is likely to grow. The community also benefits from this project, since copies of microfilmed records will be provided to Pickler Memorial Library. Opportunities for public lectures and training will also be available to the community through the Local Records Preservation Project. While similar agreements with universities exist, this is the first one whereby the Local Records Program has been provided physical space on campus to perform this work. Almost 1,400 fourth-, fifth- and sixth-grade students will visit Truman for the Children’s Literature Festival from 9 a.m.-2:15 p.m. April 20 in the Student Union Building. Visiting authors and illustrators include Tracy Barrett, Eric Berlin, Henry Cole, Lulu Delacre, Mary Downing Hahn, Cheryl Harness, Kate Klise, Kirby Larson, Rosanne Parry, Kurtis Scaletta and Suzanne Morgan Williams. Students will participate in 30-minute sessions with the guest authors and illustrators. All children attending must be pre-registered. University faculty, staff, students and other interested adults are welcome at any of the sessions. Anyone interested is welcome to attend an informal meeting and book signing with the authors and illustrators from 3-4 p.m. in the Student Union Building Room 3000. Refreshments will be served. The festival will conclude with a dinner at 6 p.m. and a presentation by author Kirby Larson at 7 p.m. in the Student Union Building Activities Room. The dinner is limited to pre-registered adults and children accompanied by an adult. The cost of the dinner is $10.75. To register for any event, contact Daisy Rearick at drearick@truman.edu or call 785.4048. The Children’s Literature Festival was an annual event for 21 years, but discontinued in 2004 due to budget cuts. A Children’s Literature Festival Fund was started in 2007 in an effort to bring the Festival back, and it returned in 2009. For more information about the fund, contact the Office of Advancement at 785.4133 or visit giving.truman.edu/SpecialInitiatives/ChildrensLiteratureFestival.asp. The Children’s Literature Festival is sponsored by Pickler Memorial Library with financial support from the Freeman Foundation, Follett High Education Group–Truman State University Bookstore and the Truman State University Foundation. The festival is also supported by the Institute of Museum and Library Services and Technology Act as administered by the Missouri State Library. Truman will host the 25th Undergraduate and 10th Graduate Student Research Conference (SRC) April 17. The SRC is a celebration of undergraduate and graduate research, scholarship and creative achievement. To provide an opportunity for all students and faculty members to attend the conference, no classes will meet during the day. Evening classes will meet at their scheduled times. This year’s conference will feature contributions from more than 400 undergraduate and 34 graduate student authors, mentored by 127 faculty members. Presentations will take the form of oral papers, posters, performing arts and studio arts. The SRC website, available at src.truman.edu, provides information on all presentation abstracts, which can be electronically browsed and extensively searched. Customized schedules can be created on the website. As the SRC Plenary speaker, Truman will welcome visiting scholar, David Micklos, executive director and founder of the DNA Learning Center at Cold Spring Harbor Laboratory in New York. Micklos specializes in eugenics as well as incorporating DNA technology into middle and high school curricula. A description of Micklos’ plenary address can be found on the SRC website. In addition, Micklos will be available in a meet-the-speaker event to discuss Nobel Laureate James Watson and DNA molecular biology in general from 4:30-5:30 p.m. April 16 in Magruder Hall 1096. Oral papers will be presented in Violette Hall and Magruder Hall. Music performances, art exhibits and oral presentations will be featured in Ophelia Parrish. Hard copy program booklets will be available in buildings with presentations. There will be no registration table or name tags at the SRC event. A continental breakfast and morning and afternoon refreshment breaks will be available in all presentation buildings. A concurrent poster session and SRC reception will take place in the Student Union Building Georgian Rooms from 3:30-4:30 p.m. The College Republicans, in cooperation with the Clair Boothe Luce Policy Institute, are sponsoring a presentation by best-selling author and conservative pundit Ann Coulter at 7 p.m. April 12 in the Student Union Building Activities Room. Coulter is the author of seven New York Times best-sellers and is a nationally syndicated columnist. She is a frequent guest on many TV shows, including the “Today” program, “Good Morning America,” “The Early Show,” “The Tonight Show with Jay Leno,” “Hannity,” “The O’Reilly Factor” and HBO’s “Real Time with Bill Maher.” She has been profiled in numerous publications, including the April 25, 2005 cover story of Time magazine. A Connecticut native, Coulter graduated with honors from Cornell University, and received her J.D. from the University of Michigan Law School, where she was an editor of The Michigan Law Review. Coulter clerked for the Honorable Pasco Bowman II of the United States Court of Appeals for the Eighth Circuit and was an attorney in the Department of Justice. After practicing law in private practice in New York City, Coulter worked for the Senate Judiciary Committee, where she handled crime and immigration issues for Sen. Spencer Abraham of Michigan. From there, she became a litigator with the Center For Individual Rights in Washington, D.C., a public interest law firm dedicated to the defense of individual rights with particular emphasis on freedom of speech, civil rights and the free exercise of religion. Free tickets may be picked up at the Student Union Building Information Desk or the Public Relations Office in McClain Hall 202. Tickets may also be picked up at Edna Campbells gift shop in downtown Kirksville or the Kirksville High School. Free tickets will also be available at the door starting at 7:30 p.m. on April 14. For more information on how to obtain tickets email pr@truman.edu. 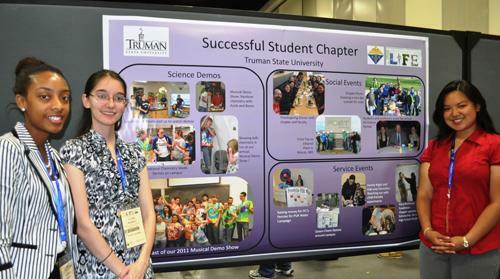 Truman’s American Chemical Society (ACS) recently sent three students to the National Conference in San Diego, Calif., March 25-29 to present a poster featuring their chapter’s activities and accomplishments. While present, they also received the “Outstanding Chapter Award” for undergraduate student chapters. This is the third consecutive year they have earned this distinguished award. Members of Truman’s American Chemical Society showcase their chapter’s activities on a poster in San Diego, Calif. Pictured, from left to right: Alexis Morris, Laura Marolt and Carolyn Lee. Their trip to the National Conference was sponsored through support from Truman’s Chemistry Department and the local ACS professional chapter as well as a grant from the National ACS Organization. At this conference, the students were able to meet and network with a variety of professionals in both industrial chemistry and academia, as well as share information with other student chapters from across America. Their presentation focused on the service events provided by their chapter, including National Chemistry Week events in the fall and their annual spring Musical Demo Show, which will be April 15 in Magruder Hall. Additionally, the Truman ACS sponsors a yearly scholarship through local high schools for graduating seniors who intend to pursue a chemistry major at the university level. Soles4Souls, the international shoe charity is going green for the month of April; literally. The charity’s website has been changed to green for the entire month and Truman’s Student Recreation Center has decided to get on board with their support. With an average of 700 million pairs of shoes thrown away by Americans each year, the effect on the nation’s landfills and atmosphere could be devastating. Soles4Souls is doing their part to change that. By recycling gently worn shoes, the discarded footwear will be given a second chance. By being redistributed through the charity’s international and domestic partners, millions of children and adults could receive their first pair of shoes. “We are excited to affiliate with Soles4Souls and we’ll be accepting gently used shoes like gym shoes, dress shoes, sandals and boots,” said Sue Limestall, director of campus recreation. Collection boxes will be available April 16-21 at the following locations: the Student Union Building, Student Recreation Center, athletic training room and each residence hall. Soles4Souls has distributed more than 17 million pairs of shoes around the world with the help of partners like the Student Recreation Center. With one in every four adults in the world living in extreme poverty, basic necessities like shoes are simply unavailable. In developing nations like Haiti, Honduras and Tanzania, walking is the main form of transportation, and shoes can protect feet from cuts and infections. Sidney Watson of Saint Louis University will discuss health care reforms from 7-9 p.m. April 10 in the Baldwin Hall Little Theater. Attendees will learn about key features of the law, how the law affects college students and young adults and how the comprehensive health insurance reforms will unfold during the coming years. Before Watson’s talk, students and faculty are invited to a reception with refreshments entitled, “Are You Covered? What’s Up With Health Care Reform?” at 6 p.m.
Watson is a nationally-known scholar and specialist in health law and health care access for the poor. She has spent her legal career advocating on behalf of low-income people, both as a legal services lawyer and as a law professor. The St. Louis University Center for Health Law Studies has been rated the No. 1 program for health law studies by U.S. News and World Report for several years in a row. This is a great opportunity for anyone who is interested in graduate study related to practicing law, medicine, advocacy or public health. Admission is free for the event, sponsored by the Multicultural Affairs Center, the Nursing Students Association, AMSA and Alpha Chi Sigma. Klinginsmith is a retired Kirksville attorney, the 2010-2011 President of Rotary International, professor emeritus of business administration and former general counsel for Truman. Going Global information day will be from 10 a.m.-3 p.m. April 11 in the Student Union Building. It will offer information about studying and working abroad. All majors are welcome. A question and answer session will follow. For more information, go to leadershipgrad.truman.edu. Thirteen men will compete for the title of “Mr. 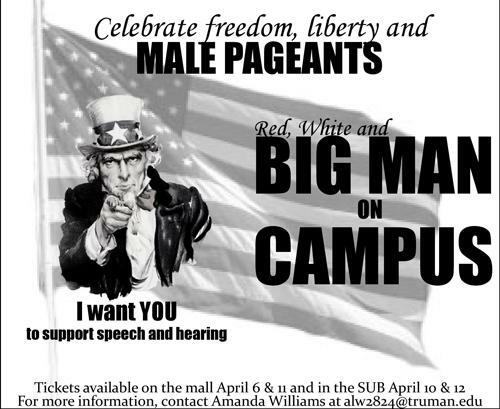 ‘Merica” in the 15th Annual Big Man on Campus Competition: Red, White and B.M.O.C. The proceeds will go to Delta Zeta’s national philanthropy as well as to the winner’s charity of choice. Some of the proceeds will also be donated to Truman’s Speech and Hearing Clinic. Tickets will be $5 at the door and $3 in advance April 11 on the Mall or April 10 and April 12 in the Student Union Building. Mock Interview Day will take place April 13. Mock interviewers from all majors will be in attendance. To register, please bring a resume to the Career Center. To learn more about Mock Interview Day and who will be attending, go to career.truman.edu. Lambda Pi Eta invites all Truman students to compete in the 2012 Chandler Monroe Oratorical Contest April 21. Students may compete for cash prizes with ceremonial, informative or persuasive speeches. Registration is open now through April 13. For more information and to register online, visit communication.truman.edu/chandlermonroe2011.asp. The National Communication Association Student Club is hosting the event “TOMS One Day Without Shoes” in conjunction with the worldwide TOMS event April 10. On this day, the club will spread awareness of the impact a pair of shoes can have on a child’s life by asking the Truman community to take off their own. Millions of children live without proper footwear, exposing them to injury and disease everyday. “Shoeless” t-shirts will be available to purchase for $6. Contact btw5342@truman.edu or visit the Facebook event TOMS ONE DAY WITHOUT SHOES for more information. Admission is free. The rain site will be Pershing Arena. Rain site tickets are available with a student I.D and are also free. Sigma Kappa's RespEKt Movement, designed to raise awareness about the dangers of hazing, will take place April 18-20. Information will be available on the Mall about what constitutes as hazing and how to avoid hazing practices. Senior Kelly Gorman organized this campaign based on similar projects that other Sigma Kappa chapters have conducted. This inaugural promotion will be fairly low-key, but “hopefully [the] program will continue to grow in the years to come,” Gorman said. The organization hopes this campaign will raise awareness and prompt any organization that engages in hazing to reassess its decision. In addition to information on the mall, Sigma Kappa will post signs across campus to share statistics and facts about hazing. Current “Saturday Night Live” cast member. For each food item donated, the library will waive $1 in fines. Dennis Leavens, professor emeritus of English literature, has accepted a position as provost of the American University of Armenia. Leavens has served as associate dean and interim dean in the Faculty of Humanities and Social Sciences at United Arab Emirates University in Al Ain, United Arab Emirates, for the last seven years. He assumes his position in Yerevan July 1. Antonio Scuderi, professor of Italian, presented “World Music in the Songs of Renato Carosone” at the Italian Music as Poetry Conference March 31 at Indiana University in Bloomington, Ind. Truman students won three first place and two honorable mention awards in the 2012 Missouri Broadcast Educators Association (MBEA) student media contest. The awards were accepted by students who accompanied Mark Smith, associate professor of communication and MBEA vice president, to an MBEA conference/ceremony at Missouri State in late March. First place awards went to the projects of Sam Sherman, Geoffrey Woehlk, Sam Spencer, Paul Bischoff, Patrick Gross, Andrea Hewitt, Faith Martin and Jessica Scheetz. Honorable mentions were awarded to the work of Natalie Turney, Brian Wells and Geoffrey Woehlk. The Department of Music’s Concert Percussion Ensemble II will present its spring concert at 6 p.m. April 10 in the Ophelia Parrish Performance Hall. The ensemble is conducted by graduate teaching assistant Culver Hackel and will feature a wide variety of chamber music for percussion instruments. Admission is free. The next Physics Colloquium, “Photorefractive Polymers: Amalgamation of Organic Chemistry, Solid State Physics and Optics” will take place from 4:30-5:30 p.m. April 11 in Magruder Hall 1096. Spring Awakening will run at 8 p.m. April 11-14 in the James G. Severns Theatre. Tickets are free and are now available at the Ophelia Parrish Box Office. Patrons can reserve tickets in person or by calling 785.4515. The Escape the Titanic Party will be from 11 p.m.-2:30 a.m. April 11 in the Student Recreation Center. Participants will complete different activities to escape the ship before it sinks. The next Board of Governors meeting will be at 1 p.m. April 14 in the Student Union Building Conference Room. A Service Recognition Luncheon will recognize 127 faculty, staff and retirees at 12 p.m. April 16 in the Student Union Building Georgian Room. Tickets are $10 in the Human Resources Office, McClain Hall 101, and must be purchased by April 10. A complete list of this year’s honorees may be found at hr.truman.edu/recognition/srb/2012honorees.asp. The Women’s Resource Center is accepting applications now through April 16 in the Women’s Resource Center in the Student Union Building 1109 B. Applications may be submitted in paper and on TruPositions. They are accepting work-study, volunteer and scholarship workers. Labiche’s comedy “La Fille bien gardée” will be presented in French by Truman French students and faculty at 8 p.m. April 18 and April 19 in the Student Union Building Down Under. For more information, contact Patrick Lobert, professor of French, at plobert@truman.edu. Local bands Deadwood and Redwing will perform a night of blues and acoustic music at 7 p.m. April 21 in the Student Union Building Down Under. Admission is free.